Courteous, available, knowledgeable, and friendly. Everyone was very professional and helpful with my questions. Very professional and greeted with open arms. ONLY TIME WE NEEDED TEAM MEMBER SERVICE WAS GETTING DIRECTIONS FROM THE BILTMORE HOUSE ON FRIDAY. I CALLED AND A VERY NICE WOMAN ANSWERED AND GAVE US PERFECT DIRECTIONS. SHE WAS VERY NICE AND VERY HELPFUL. While searching online, the posted pictures are what attracted us to the property. When we arrived to the cabin, the pictures didn't do it justice. The cabin is beautiful! Even more so in person. Very nice and quiet. Loved the view and the porch with the chairs an swing. We ate Kobes once and it was so good, we cooked at the cabin a lot. Enjoyed family time. We loved the fireplace. Can't wait to come back. Love the layout and decor of the cabin. Magnificent view and fireplaces gave a lovely ambiance. Was surprised at how fully stocked the kitchen was including trash bags and paper towels. Can't wait to come back. This is a beautiful luxury cabin with a great view of Fontana below. My favorite reasons for staying here more than once: paved roads that make it easy for travel, gated community that keeps the quad runners and wanderers out, cabins are spaced apart enough to offer a lot of privacy, it's a clean and spacious lodge that is very well maintained, the owners added additions and improvements between our two reservations, and the company that manages the rental is prompt and courteous when responding to any concerns. If I am ever lucky enough to have a cabin for my retirement, I hope it's half as nice as this one. Everything that you will need is included except for food. Shopping is close by in Bryson City, where you will find an Ingles and liquor store. What I love to do most here is start a wood burning fire in the outside fireplace and sit in the hot tub while staring at the stars in the night sky - an amazing thing to see with so little light pollution - like glitter dust in the sky. 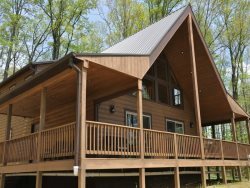 On the other side of the cabin, the owners extended the deck and added a fire pit with built in benches so family (or friends) can sit around the fire for an enjoyable evening. The kitchen is large and well appointed, there is a screened outside porch area that is great for a card game at night or breakfast in the mornings. Sleeping is either in the suite on the ground floor or the loft (2 bedrooms) above. I have recommended this lodge to many people - I even inquired about the property for sale a little bit above the lodge. Maybe some day. LOL You won't be disappointed at Big Timber Lodge. It's everything that I imagine a Smoky Mountain vacation should be. Our family had a wonderful time making memories in this beautiful cabin. It was very clean and well decorated and the view was breathtaking. Especially the sunrise's.